The universe is a huge fairy tale. Wonders are everywhere. From tiny human body that grows in womb to Galaxy up there. The volume of wonders all around us is simply beyond words and grasp. As Tagore, the great poet of India says, In this great universe, marvelous cosmos, spectacular garden, I, a man wonder with great awe. Photo of Andromeda Galaxy (M31), ultraviolet image from the GALEX satellite. Two regions of the ultraviolet (UV) spectrum were examined, the far (FUV) and the near (NUV) regions. FUV (blue) is from the young, bright stars in the galaxy's spiral arms. The NUV emissions (orange) show the older stars in the galaxy's centre, as well as foreground stars from the Milky Way. 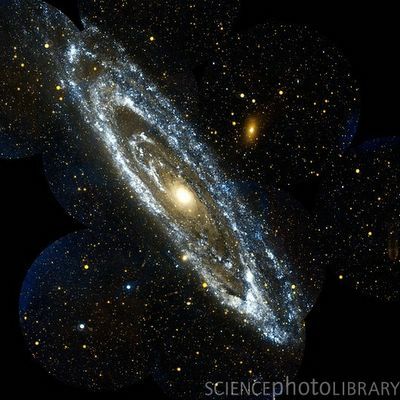 M31 is the nearest large galaxy to our own. It is 150,000 light years across and 2.2 million light years distant. Image data obtained in 2003. The GALEX (Galaxy Evolution Explorer) satellite is designed to use UV sensors to study the evolution of galaxies.